What was the school like during the Second World War? We have heard that the Germans often took schools and dormitories for their own use, making the schools move or close. 94 out of 120 schools in Finnmark were burned the autumn 1944. But this does not mean that there was no school during the war. Some places in Eastern-Finnmark there was schooling more or less all the time, and also in other places most children more or less got schooling. But how was this school? How did the war situation and the Germans and the Norwegian Nazis' rule affect the content and daily life in the schools. It has been written very little about this situation. 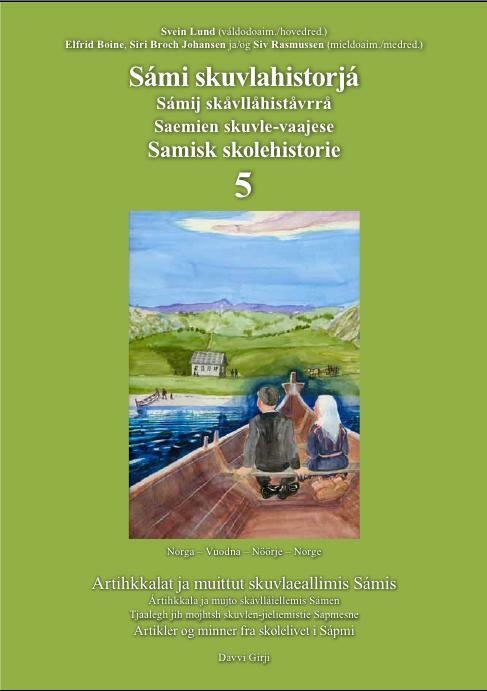 We have gathered some pieces of information in Sami School History 5. Following are excerpts from two of the articles in the book. In the beginning the teachers continued to teach as before, but gradually the Nazis interfered more and more with the school. 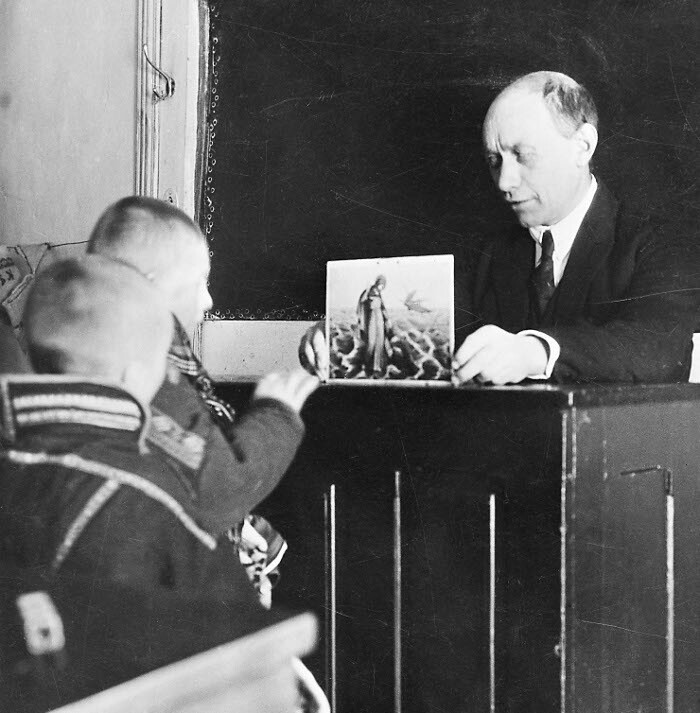 The teachers were under strong pressure to teach according to the Nazi ideology, but it was also opposed strongly. It was a lot of talk about introducing completely new curriculums and educational books, but the new curriculums were never made. 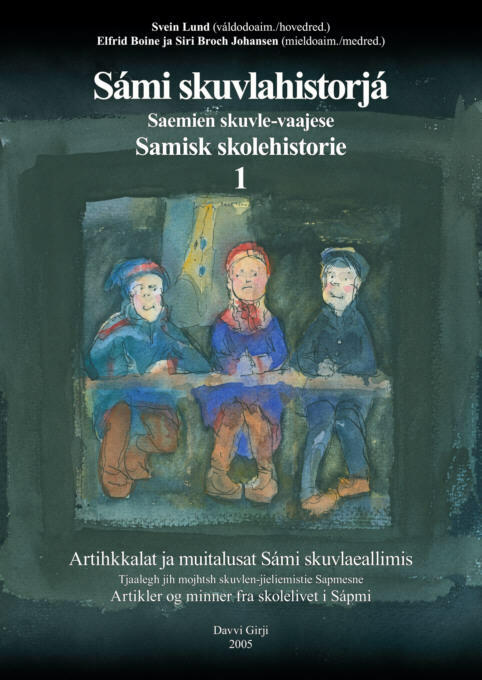 A few new educational books were made, marked by the ideology of the NS (the Norwegian Nazi party), while other books were «authorized for use in school». 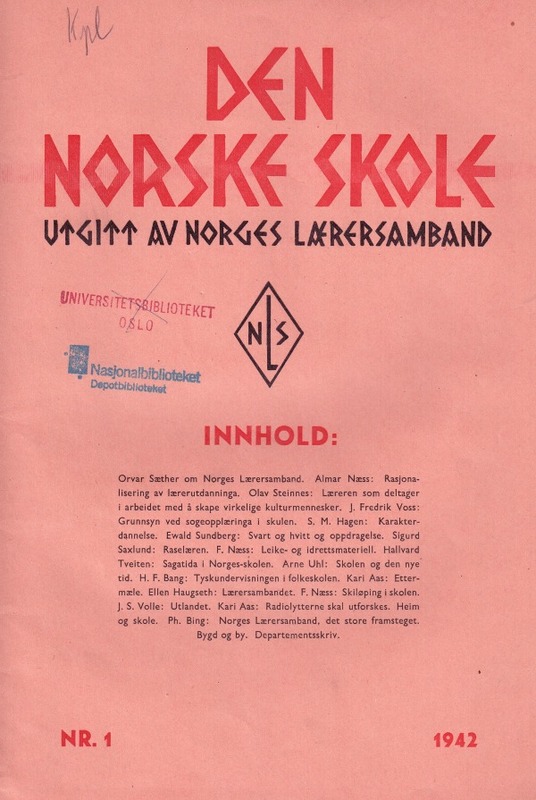 In 1942 Quisling's government decided that all teachers should take part in «Norsk Lærersamband» (Norwegian union of teachers), which was completely controlled by the NS. If one was not a member of the union one could loose the position as teacher. Den norske skole (The Norwegian school) was body of Norges Lærersamband (Norwegian Union of teachers). It was sent to all teachers, but many did not accept to be considered as members of NLS and followed the orders of the home front to return the magazine. On some of the copies we have found of the magazine in libraries, someone has crossed out the field of the addressee and written: «Return. Not subscriber». «To my enquiry per telegram to the Ministry of Church as to whether the schools could be started again after the easter if the teachers were willing, the reply was: the schools can only continue with teachers who are members of the Union of teachers. Later some people here have tried to make of indirect means to avoid me to get the schools started, but they have not succeeded. One schoolmistress had started with the pupils from the lower secondary school in her private home. But today I was able to stop the school, and the pupils had to go home. It is not pleasant to have to act in this way and fall out with colleagues, but I suppose it is must be done. 19.12.1942 Augestad again wrote a letter to the district leader Tveiten, where he describes some of the resistance among the teachers in different places in Finnmark. «... Talked to teacher Lillevik at the meeting of the trustees here. There were many hard-boiled ones in Mehamn, he said. 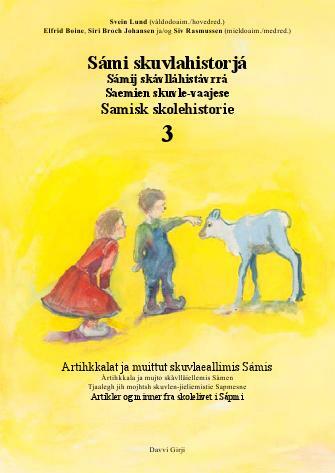 He has also heard ( from Kautokeino, e.g.) that several are refusing to write on the filing cards. - No, we are not done yet. All means are used in the battle. ... The director of schools told that the mayor in Tana wanted to get all teachers away and remove some from office, so there it seems to be compact. Lyder Aarseth came to Kautokeino as teacher in 1913 and became Director of schools in Finnmark in 1933. He was removed from office by the Nazi rule in 1943 and appointed again as Director of schools after the Liberation. 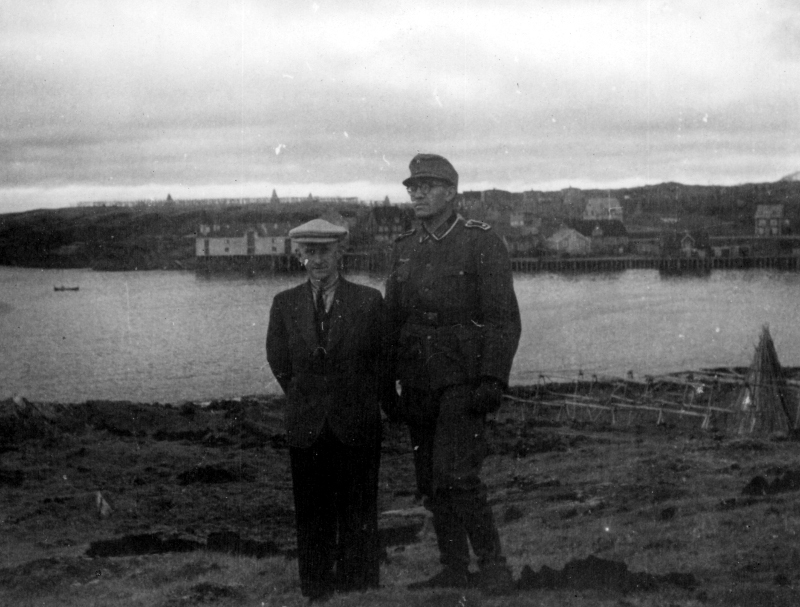 Bjarne Lillevik with the German officer Wilhelm Brüggemann, Mehamn September 1942. As soon as the war ended the teachers and school leaders who the Nazis had dismissed got their jobs back, and those who had been placed in their positions were dismissed. Then the investigation and trials against those who had cooperated with the NS and the Germans began, and the teachers were a central part of this confrontation. Many teachers were sentenced to loss of their positions, and some were sentenced to jail. In Finnmark Bjarne Lillevik, who the Nazi government had appointed as director of schools was probably the one who got the most severe punishment. He was sentenced to forced labour for five years, loss of rights for10 years and he was sentenced to loss of his teaching position with no time limit. What he had earned from being director of schools was confiscated. I was supposed to start school in 1941, but at the time the conditions in school were very turbulent. The Germans had taken the dormitories, and they only let the children live there for periods of time. Which meant that for us who needed to stay in the dormitory we did not have much time in school. The dormitory burned in 1944 and the school was moved to the District Sheriff's farm, to the assembly house. That is where I started school in spring 1944. The school lasted for six weeks at that time. The teacher was Norwegian speaking, Madsen. I did not understand anything. 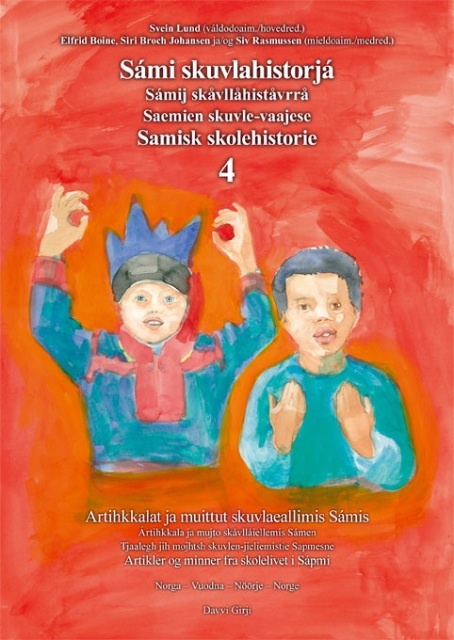 Supposedly he knew Sami, but he was not allowed to speak Sami in school. 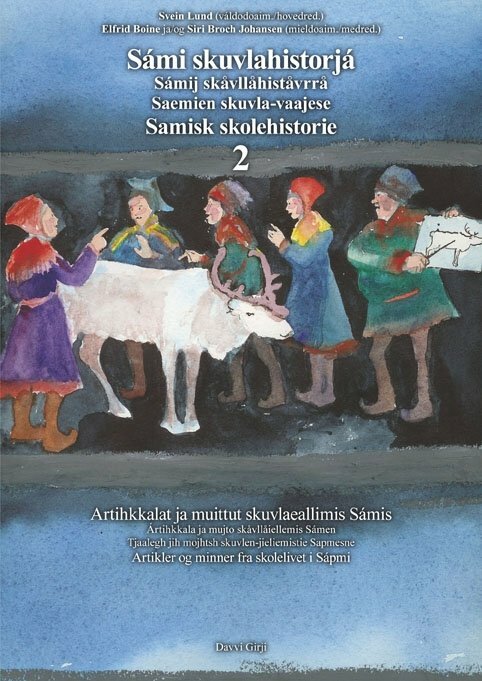 That is how the policy was back then, the Sami language was supposed to be exterminated. Madsen had a radio, and some times we were allowed to listen to it. It was very strange. I had never seen or heard a radio before. I had to examine it properly, because I wanted to see where the person who was speaking was. Normal people were not allowed to keep a radio during the war, only those who were Nazis. And Madsen was a Nazi. It was something everybody knew, although we did not dare to speak much about it. In total it was about 4–5 people in Kautokeino who had a radio during the war.